The decline of free speech on college campuses is not the root problem; it’s a concerning symptom of a broader malady. In particular, the folks who are concerned about this issue1 posit that there’s a tendency of a radical minority to shut down political discourse as a political tactic. Although a lot of problems in the country are bipartisan, this one isn’t. It’s a peculiarly left-wing malady that reflects a growing contempt by many on the modern left for the values of liberalism that once defined it. I mean liberal in the old sense of the word, as in emphasizing individualism. How Skewed Is My Blogging? Also, I blame you for latching me onto this blog and am grateful every time I read it that you did. “There’s an upward trend if ever I saw one.” What do you suppose would be the statistical significance of the claim that there’s an upward trend? This quote suggests that you think it’s virtually certain–that the probability that this is just noise is virtually zero. Perhaps it’s worth reminding you that the N here isn’t 4,700 (the number of schools), but the number of speakers, which is likely at least two orders of magnitude greater. A rise from 6/500,000 to 35/500,000 doesn’t seem like such an obvious slam dunk, especially in the context of a countervailing trend in liberalization of speech codes (which you neglected to mention). 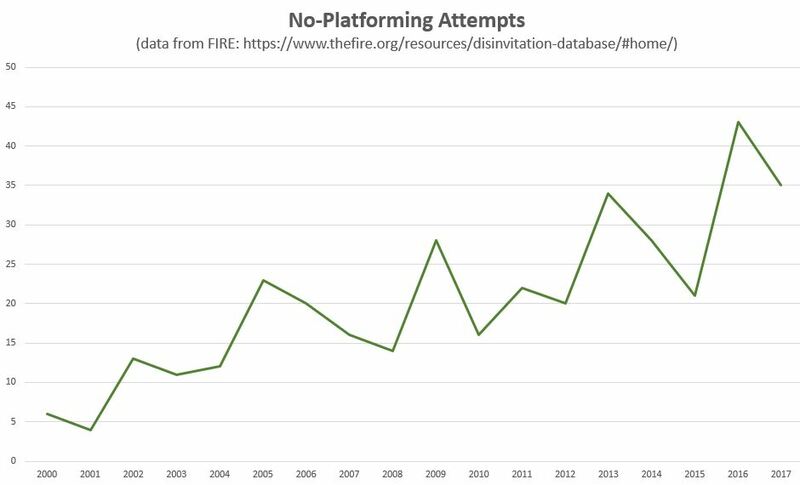 I’m also a little concerned about the use of FIRE’s methodology of categorizing the problem by the ideology of the people doing the no-platforming, because it falsely suggests that the victims are the other side. Frequently, that’s not the case–because the young and educated are so much more liberal than average, it’s often other speakers from the left who draw their ire. Even worse, it also suggests that the problem is far more widespread among young leftists than young rightists, but it doesn’t address the base rates of leftism and rightism among college students. 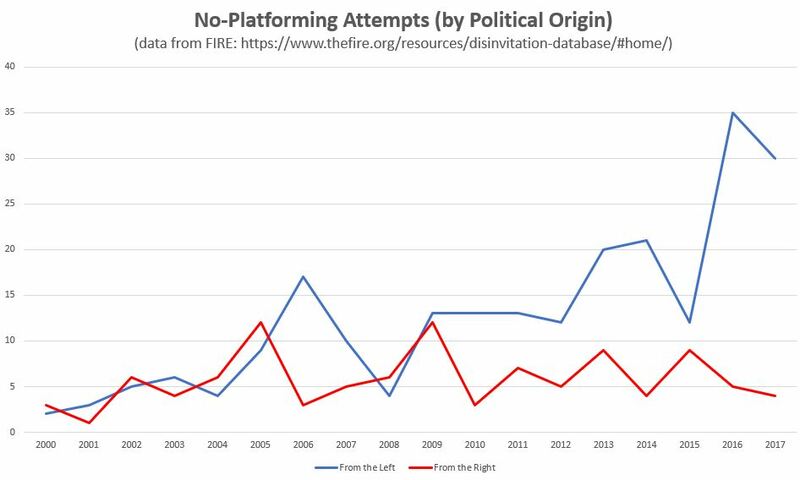 So, yeah, many more of the college students who attempt no-platforming are liberal, but that’s exactly what we’d expect if the rates of no-platforming attempts were identical between liberals and conservatives given how many more college students are liberal. Were we to restrict our area of study to the elderly, or gun owners, or evangelicals, we’d find that whatever actions we chose to measure (which stifle free expression or do anything else) are far more likely to come from the right. “…[W]hat kind of survey does the WaPo piece rely on? One that asks whether or not gay people should be allowed to give a speech. I kid you not. That, and an example about an anti-American Muslim cleric, are the leading examples. If you wanted to design survey results to be willfully blind to the actual concern, you couldn’t do better than this.” Sure, you could. You might omit some of the questions you yourself omitted in characterizing the study. For example, the questions about whether a person who supports military rule should be allowed to speak or teach, or a person who believes Blacks to be genetically inferior. As I recall, the attempt to disinvite Charles Murray of The Bell Curve fame was one of the prime examples of this supposed crisis, but the GSS suggests the attitudes behind that problem aren’t increasing. Interestingly, the trends aren’t that different from the more liberal-leaning questions–racism response hasn’t really changed, but military fascist speech is now more tolerated. Kelsey, thinking about the statistics and the scale, I think it probably does not matter in the least what the unobserved denominator is. As you get more trials with a lower chance on each trial, the distribution becomes a “Poisson” where you just model the number of events that occurred, not the probability of each event. Obviously, it would be nice to see a pre-2000 set of data, but based on what we have it does appear to be pretty obviously on an upward trend in the last 20 years. And it’s a long list, including folks from left, right and center, which I’ve researched in pieces like this one. This isn’t some random, convenient definition I found. It’s the #2 search result for “critical race theory” and comes from the UCLA School of Public Affairs. Not sure Kimberlé Crenshaw, the founder of Critical Race Theory itself, had anything to do with it, but she is a professor at the UCLA law school.